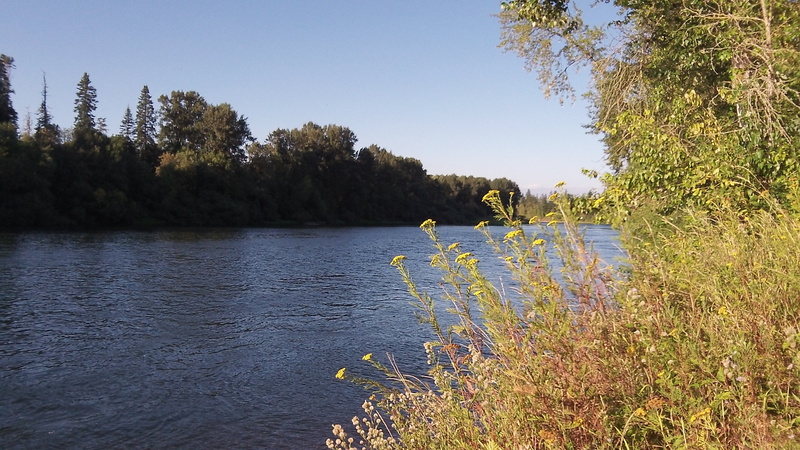 The Willamette near Albany: How much will new rules help the river? Barring an appeal to the Land Use Board of Appeals, Albany’s program of keeping rainwater from new developments from reaching the Willamette River will start in 2015. It will come with significant new costs, and while the program makes sense as a concept, the people paying the bill might be happier if the benefits were as clear as the cost. Three council members might be happier too. Rich Kellum, Bill Coburn and Jessie Johnson voted no. Mayor Sharon Konopa broke the 3-3 council tie and voted yes, saying the program will be great for Albany. Maybe, but the actual benefits in terms of pollution reduction are likely to be too small to notice, largely because the Willamette River runs brown with mud after every heavy winter rain. Starting Jan. 1, developers building on more than one acre in Albany will have to construct stormwater containment and disposal facilities depending on the percentage of impermeable surface such as parking lots, streets and rooftops. Jeff Blaine of Public Works told the council the additional construction costs may be in the neighborhood of $3,000 per lot of a residential subdivision and $18,000 for a one-acre commercial development that builds on or paves 85 percent of the site. Now, the city went through a long public process to come up with this program, and some time during that process, the cost-versus-benefit question may have come up. But the council didn’t ask about it before Wednesday’s vote. The city staff cited state and federal clean-water regulations as the reasons why Albany has to have something like this, and they say that the program is designed to be the minimum needed to reach compliance. That too, council members might have wanted to ask more about. Under the TMDL anti-pollution (“Total Maximum Daily Load”) regime governing the Willamette Basin, the state is trying to reduce bacteria and mercury in the river and lower the water temperature during fish migration periods. Theoretical models may show how a collection of rain gardens and bioswales can affect those parameters. But it’s hard to believe that the effect is significant if you look at the river’s mud-laden flow after weeks of rain in February. Dan Watson presented contrary monetary findings at a recent City Council meeting. His estimates of costs were closer to $50,000 per acre. Jeff Blaine did not dispute Dan’s findings. Blaine didn’t explain where Watson was incorrect. Blaine merely said he disagreed and felt that his own estimate was more accurate. How Watson’s figures were inaccurate Blaine never attempted to explain. Taxpayers spent many millions to pay for Talking Waters. The purpose was to lower the heat in Albany’s effluent as required by government. Evidently the millions spent were not enough to do the job even though we were assured back then that the theoretical models were correct. Now millions more are being demanded by city government. Did the model change? This looks like a simple grab for more money from taxpayers. Why should taxpayers believe anything government says on this issue? With regard to Gordon Shadle’s comment below and some other thoughts that come to mind, this issue is different from the one being addressed at Talking Waters, as I understand it. Additionally, other issues come to mind that deserve consideration beyond that given by our city council, as far as I am aware. Talking Waters deals with lowering the temperatures and raising the oxygen content of TREATED wastewater before being finally discharged into the river. This new proposal deals with rain run-off that should go to storm drains and otherwise UNTREATED, directly to the river, if I understand the issue correctly. Wasn’t the reason cities everywhere spent so much money to separate storm water from wastewater so that sewage treatment plants didn’t have to deal with storm run-off, which could then drain directly to the river without treatment? That was the point. Now the water that was once deemed by government to be acceptably clean to dump straight into the river…no longer is. Talking Waters never sees the water this proposal addresses. It is not supposed to. Having said that, I am very reluctant to accept the opinion of one person/agency as to the actual anticipated costs of any proposed action. My experience in the construction industry showed me that “engineers/architects estimates” can be wildly inaccurate, both high and low, and that the truth won’t be known until contractors actually build these “features” while tracking their costs to construct them. They cost far more to build than standard separator boxes (which must be cleaned out periodically, and those costs calculated as well). No two properties are the same so there will be variations from that factor as well. Is this a wise use of public funds? Is there so much pollution in storm water run-off that a real need is being addressed? Certainly there is some oil, lead, and likely some mercury, and other substances in this water but does the amount warrant millions of dollars of expenditure of public money? or is this just another way to keep government employees employed going forward? (sort of government form of “make work” projects that seem so prevalent since the ’70’s). It also occurs to me that this is a mandate from the state, directing cities and local government to come into compliance due to their ruling, so I’m not sure it’s fair to place all the blame on the cities either. Likewise, could it be that the states are bowing to pressure from the federal government to meet a new standard they are imposing at the federal level? Where did the impetus for this action actually originate? That’s the question I find intriguing. Possibly another unfunded mandate the feds are so happy to pass down the chain of governance? Whenever a government entity imposes a “fee” based on “projections” by the agency that will receive those fees, my antennae come to attention. Something smells bad about that scenario. Let’s get some independent thinking going on these types of issues rather than just being spoon fed the pablum that so often is offered to us by government at all levels. That the council is not asking many questions posed in HH’s article is no surprise to me. Is the city REQUIRED to take this action? Or is it just to meet some “guidelines” that represent someone’s utopian dream of how things “should be” at great cost to the public whether taxed directly of indirectly through development costs paid when buying property. OR, is this something those on the council can hold up and say “look what we did, we are in the forefront on these issues.” Serving the public? or the ego of those in city government? Pertinent questions, in my view. Personally, I question the actual value to the public and the environment in these “bioswale” features, and the one’s I’ve seen to date present another potential problem: Liability issues. These features, which I first noticed on Broadalbin between First and Second are deep enough to cause injury should one step or fall into one inadvertently (or after having just left one of the nearby establishments serving alcoholic beverages). Did anyone think of this? Good comments and questions. My comments were focused on “Total Maximum Daily Load”. As I understand TMDL it governs the Willamette River basin. All sources of runoff into the river are factored into the calculation. When Talking Water was built the stated purpose was to achieve government’s desired TMDL for the river in this area. But it now appears TMDL is a moving target, and that means local property owners must pay more. It’s a convenient scheme if you’re a greedy bureaucrat always on the prowl for more revenue.